Alkyne metathesis (Fürstner et al) provides a feasible alternative approach for organic chemists; combination of alkyne metathesis with subsequent partial, stereoselective reduction offers an entry towards (E)- or (Z)-alkenes under mild conditions. Alkyne metathesis refers to the mutual exchange of alkylidyne units between a pair of (non-terminal) acetylene derivatives. 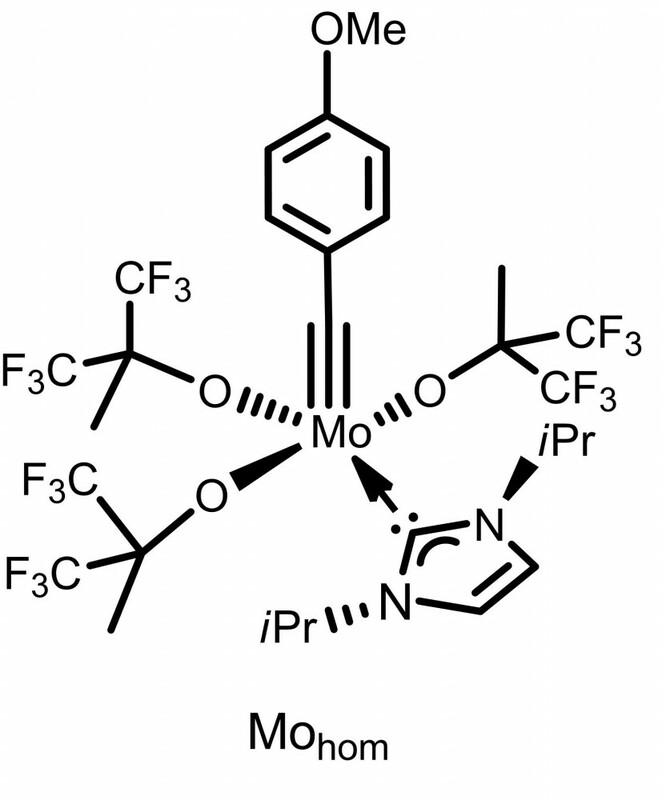 Buchmeiser et al recently reported a new class of Mo alkylidynes (e.g. 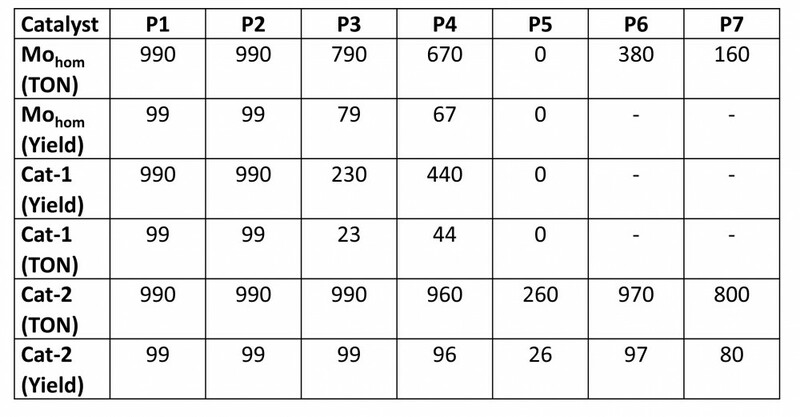 Mohom) bearing N-heterocyclic carbenes (NHCs) and their catalytic activity in some 2-alkyne benchmark reactions. They found that the Mo alkylidyne complexes preserve NHCs (e.g. 1,3-di(isopropyl)imidazol-2-ylidene (IPr) throughout the catalytic cycle, thus, NHCs might be suitable ligands for immobilization. Based on these assumptions Buchmeiser and co-workers successfully immobilized an analogous molybdenum alkylidyne complex on silica using a silica supported N-heterocyclic carbene (NHC) ligand, IPr. Immobilization has definite advantages: reuse of the catalyst, no leaching, potential use in flow reactors. Polymer or silica supported metathesis catalysts were extensively studied and used in the last decade. Two different types of silica; silica 60 and partially dehydroxylated silica 60 obtained via heating to 650°C (SiO2-650) were used. In both cases, excess silanol groups were end capped with trimethylsilyl chloride. The Mo alkylidyne complexes supported on both types of silica was active in alkyne metathesis and showed activity for a series of functional 2-alkynes. The Mo alkylidyne complex supported on SiO2-650 displayed a substantially higher alkyne metathesis activity than the homogeneous analog (Mohom) or the one supported on regular silica, which is attributed to a site isolation effect reducing the bimolecular decomposition. In the case of SiO2-650 at 650°C a partial dehydration takes place, which keeps distance between the catalyst immobilization sites, thus, prevents bimolecular decomposition. 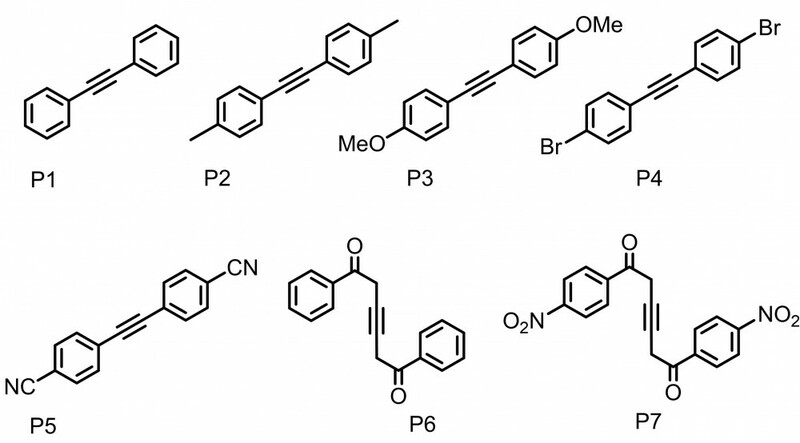 The supported Mo-alkylidyne NHC catalyst showed higher TONs compared to the homogeneous analog. 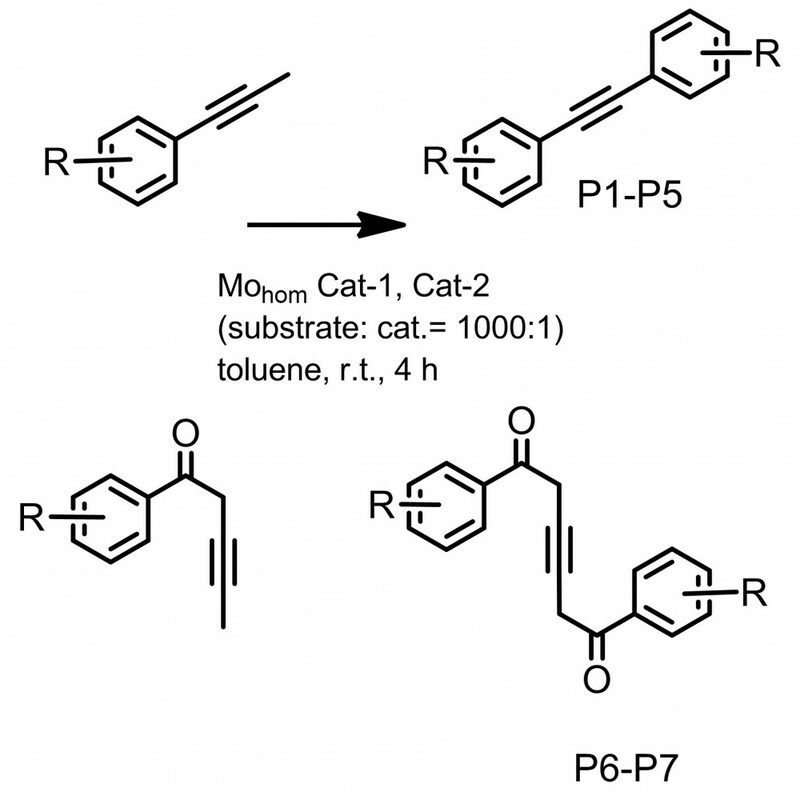 Interestingly, also substrates that are either poorly converted (leading to P3, P4) or not converted at all (a nitrile-containing 2-alkyne precursor leading to P5) by both Mohom and Cat-1 undergo alkyne metathesis with the same catalyst (Cat-2) supported on partially dehydroxylated silica. No molybdenum leaching was below the limit of detection of ICP-OES (< 2 ppm). This supports the initial assumption that the corresponding Mo-alkylidyne NHC complex remains fully integer throughout the catalytic cycle and no dissociation of the NHC occurs.